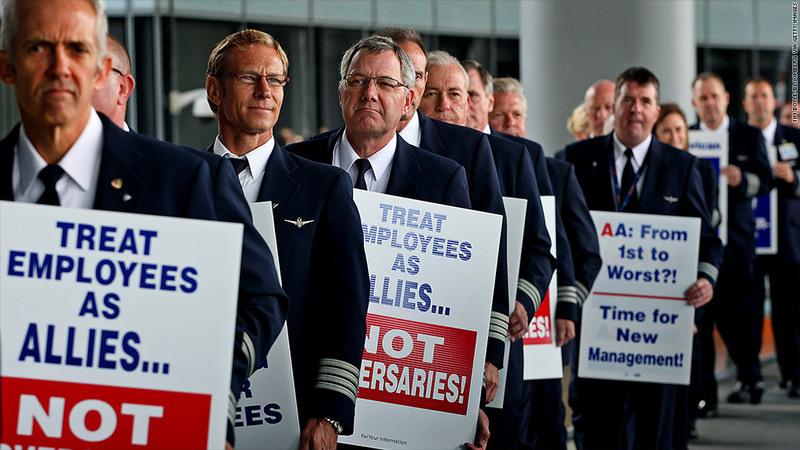 American Airlines pilots protesting the concession contract being imposed on them in September. Despite the ongoing contract dispute, the airline says it will hire 2,500 pilots over the next five years. The iconic, but troubled, American Airlines says it intends to hire 2,500 pilots over the next five years. The airline's parent AMR (AAMRQ) filed for bankruptcy protection in November, and has been locked in a contentious battle with its pilots union over its efforts to cut labor costs. In a letter to employees Wednesday, CEO Tom Horton said American Airlines will hire new pilots to staff new international and domestic routes. Company spokesman Bruce Hicks said about 1,500 of the new hires would replace retiring pilots, or jobs that open up due to attrition. American has about 7,500 active pilots today. "The new American will be doing even more international flying, providing greater opportunities for career advancement and increased income for our people," Horton said in the letter. The airline unveiled plans Wednesday to add new flights from Dallas/Fort Worth to Seoul, South Korea and Lima, Peru; from Chicago to Dusseldorf, Germany; and from JFK airport in New York to Dublin, Ireland. It also said it would increase domestic service from its hubs in Chicago and Dallas. Tom Hoban, spokesman for the Allied Pilots Association, said the union is skeptical about Horton's statement. "We once had over 13,000 pilots," he said. "It's been the incredible shrinking airline ... unless they ink it in the contract, it doesn't have a lot of credibility with the pilots." American had previously announced it would hire about 1,500 flight attendants starting later this year to replace the 2,200 flight attendants who took a $40,000 buyout package. AMR has been struggling with losses from high labor and fuel costs. The company said it filed for bankruptcy to remain competitive with key rivals like Delta Air Lines (DAL), United Continental (UAL) and US Airways (LCC), all of which had have undergone bankruptcy restructuring. AMR had said it needed to make deep cuts in staffing and reduce related labor costs to emerge from bankruptcy. The airline's ground workers and flight attendants have worked out deals with the company. But members of the Allied Pilots Association in August rejected a deal, which included having more flights flown by partner airlines, longer work hours and a possible end to the union's pension plan. Last month, the company's management won an approval in bankruptcy court to impose terms of that unpopular deal on pilots. But American says pilots began calling in sick and filing frivolous maintenance reports that caused flight cancellations and delays to soar, chasing away some of its key business customers. Management and the union have since returned to the bargaining table. The pilots union reported to its members Tuesday that progress is being made on a new labor deal.